Enjoy the beach resort in Cambodia! Relax and unwind by the pristine beaches of Kampong Som (also known as Sihanoukville) Discover this small quiet town and have a truly relaxing vacation. Phnom Penh → Sihanoukville transfer by a car. Enjou the beach. Enjoy sightseeing by using chartered vehicle with driver (already included) . Optional tours are also available. 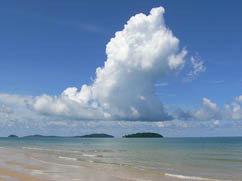 Each local tours are can be arranged upon arrival in Sihanoukville. Tours will be charged at your own expense and at your own risk. •	transfer from hotel to airport fee excluded.